We have been try to reduce the cost and freight charge for last ten years. Then we can offer you the remarkable fine fruits from Japan with reasonable price (C&F). 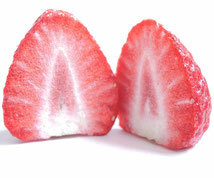 The answer is producing the freeze dried fruits used with the very fresh fruits. We realized the remarkable fantastic products have fantastic flavor, taste and color. NEW PRODUCT: We would like to introduce our new product line as below. Yuzu is a Japanese citrus that is valued for its highly aromatic rind. Yuzu became popular ingredient in the EU and US and many of chefs using the yuzu in their cuisine. 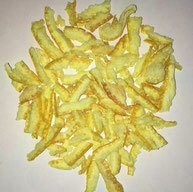 We finally produce the freeze-dried yuzu peel to remove the harsh after taste. Their fresh yuzu taste enhanced the attractive of any meals and desserts! You can enjoy the color and aroma of yuzu citrus anytime, anywhere. About the Yuzu products, we have been trying to produce the high-quality yuzu juice and yuzu peel have a rich aroma and no bitterness to meet the need of customers. The Dried products have a large advantage to exporting to foreign countries on the point that those are possible to preserved it at room temperature and have a long shelf life. 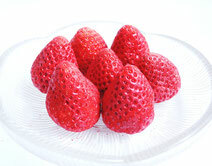 Ingredient: Strawberry from Tochigi (100%). Ingredient: Apple from Aomori (100%). This item have a strong yuzu aloma that suitable for addding the yuzu flavor with soups, desserts, cuisines, dricks and cocktails. Ingredient: Yuzu Citrus from Shikoku and Kyushu (100%).